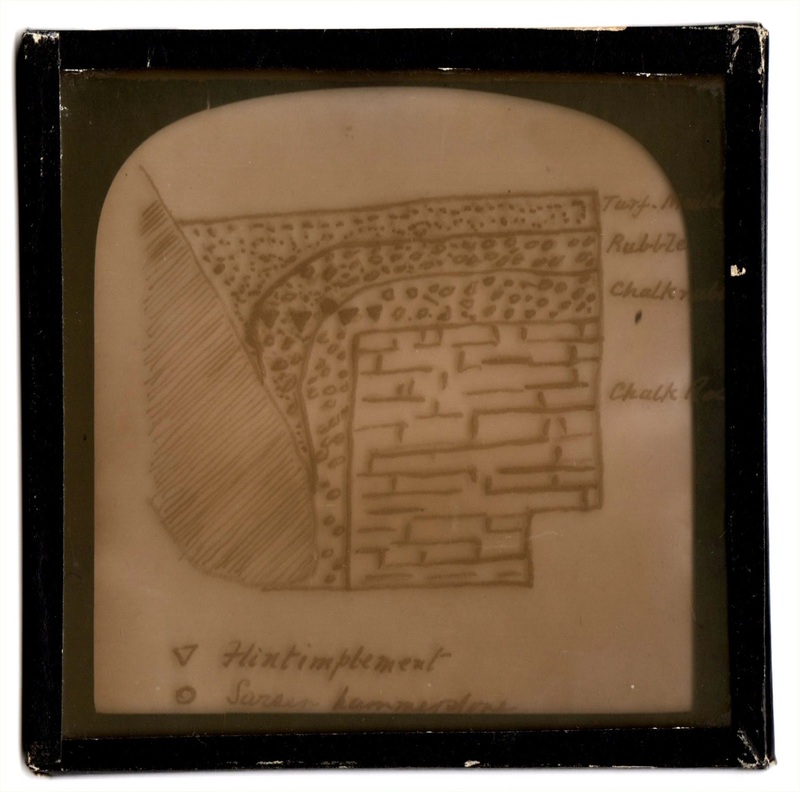 An old Magic Lantern slide from a lecture on Stonehenge that I bought for a couple of quid off eBay. It came without any history. Is it some amateur's interpretation of the excavation, hand drawn because he couldn't copy the printed illustration, or could it be from the original lectures that Gowland gave outlining his work before the report went to press? The differences in the labelling suggest to me that it isn't a copy from the report, but is an original sketch by an expert. An expert on the excavation but not in preparing slides as the labels are half hidden by the border. But then I am biased. 24. [Proceedings of Anthropological Institute]. 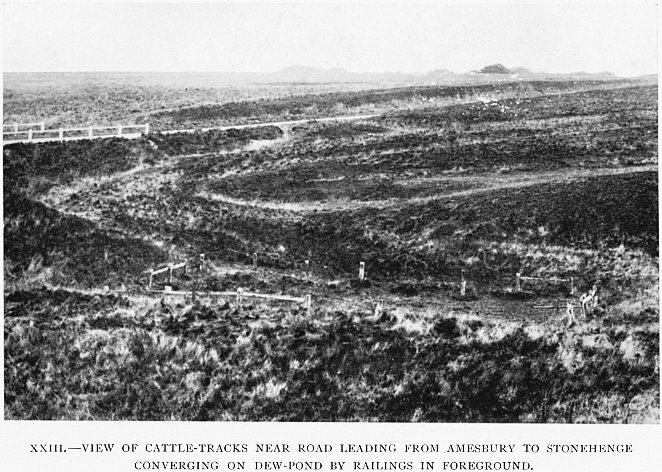 An old undated picture of the fenced pond at Stonehenge Bottom, looking North East. 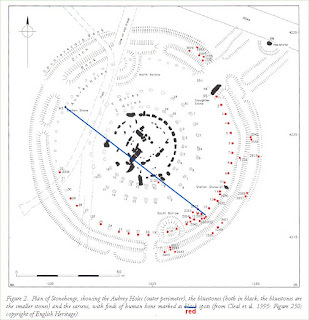 The Recent Excavations at Stonehenge, with Inferences as to the Origin, Construction, and Purpose of That Monument. The Recent Excavations at Stonehenge, with inferences as to the Origin, Construction, and Purpose of that Monument. 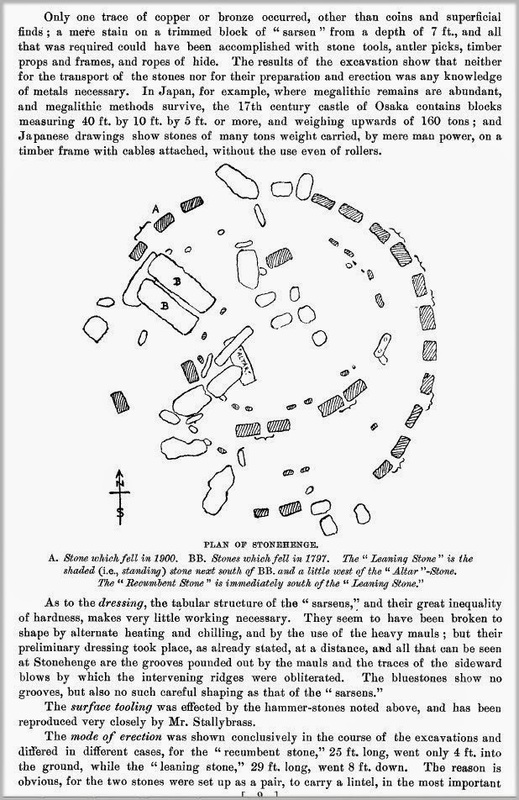 Abstract of a report presented by W Gowland, F. S. J., to the Society of Antiquaries, December 19th, 1901. 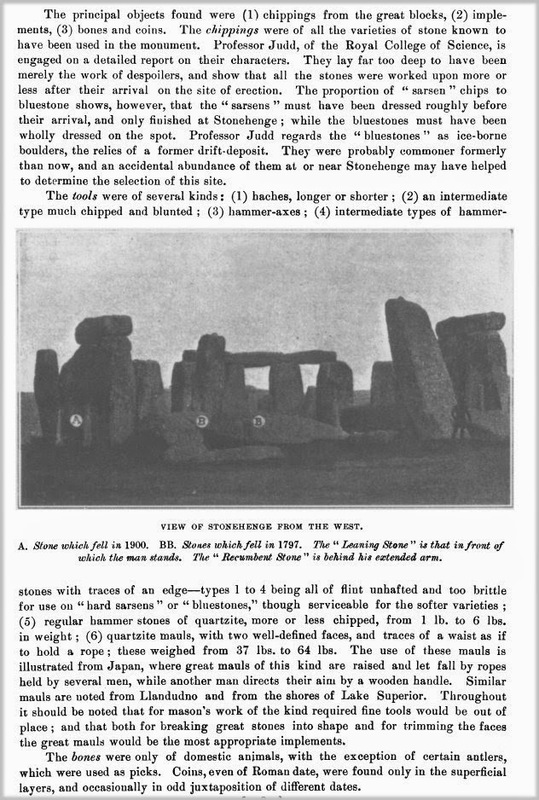 The fall of one of the uprights of the outer circle of Stonehenge on the night of 31st December 1900 (cf MAN, 1901. 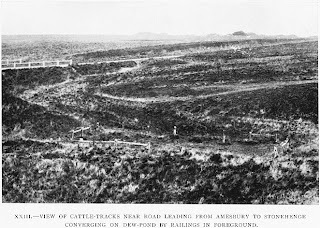 18) led the owner, Sir E. Antrobus, Bart., to permit a careful examination of the remainder by a committee appointed for this purpose, and to execute the works recommended by this committee for the protection of the stones from further damage. The engineering work was planned by Mr. Carruthers and superintended by Mr. Detmer Blow. The exploratory work was conducted by Mr. Gowland, and a most careful record was kept of every detail of the incidental finds. The primary object, the replacement of the “leaning-stone” in its original erect position, was effected by enclosing the stone—which had declined from 77 degrees in 1650 to the dangerous angle of 61 degrees in 1901, and which showed three serious fissures on its upper side—in a cradle of stout timbers, and raising it with ropes and winches, while supporting it also on the underside by struts of stout timber. To secure it for the future the whole of the underlying soil was removed in successive sections down to the rock level and replaced by concrete; and it was in the course of this excavation that the discoveries to be described were made. The mode of erection was shown conclusively in the course of the excavations and differed in different cases, for the “recumbent stone,” 25 ft. long, went only 4 ft. into the ground, while the “leaning stone,” 29 ft. long, went 8 ft. down. The reason is obvious, for the two stones were set up as a pair, to carry a lintel, in the most important part of the whole structure. The shorter stone, therefore, being set less deep, had a more elaborate base, also, to gain base, was only dressed on the parts which showed above ground. 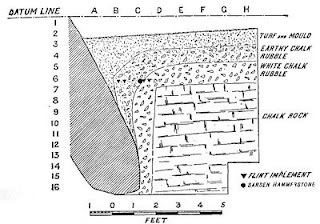 The leaning stone was erected by (1) excavating a pit with three vertical walls and one sloping rim on the side next the stone ; (2) raising the head-end of the stone by levers and timber packing till its foot slid down the sloping rim into the pit; (3) hoisting it from about 50 degrees into an erect position by ropes ; (4) securing it. in place by the smaller “ sarsens “ which support its oblique lower surface. Similar leverage is customarily employed in Japan with trunks of trees, and many rope-ends each pulled by one man. The “recumbent stone,” on the other hand, was (1) supported at its foot-end on a low wall of small “sarsens”; then (2) tipped upright, as above, against two large “sarsens” placed in front; then (3) packed tight, as above, with disused mauls. 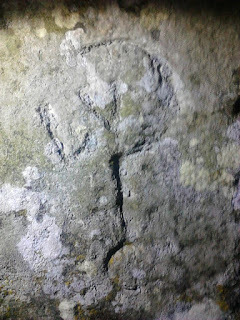 The chronology also receives important new light from these excavations. A legend is current that the “bluestones” circles are of earlier date than the “sarsens,” and that they were brought from Ireland. Both statements prove to be inaccurate. NOTES - This report differs slightly from his published report so I have highlighted two phrases in purple - the replacement of the “leaning-stone” in its original erect position,.... 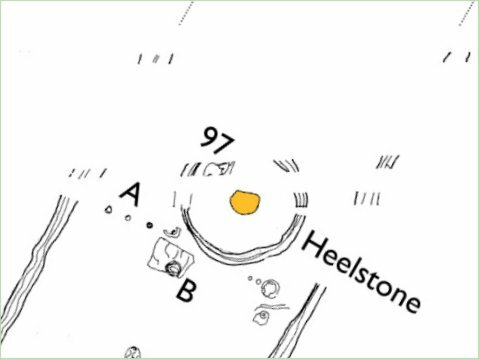 If set back in its place this indicated the “recumbent stone” would be exactly in line with the “leaning stone.”. They are of relevance as to the original postition of the Great Trilithon and my theory of its mid-winter solstice Sunrise alignment. 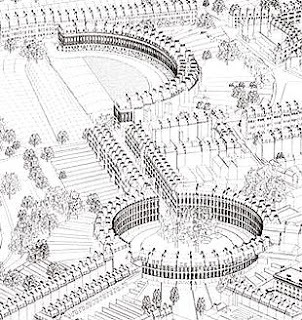 John Wood, the Elder (1704 - 1754), was an English architect, working mainly in Bath. Many of the buildings he designed are littered with icons and symbols associated with Freemasonry, leading many people who have studied his work to believe that he was a member of the organisation, even though there is no documentary proof. Wood wrote extensively about sacred geometry, and argued that the myths of the supposed founder of Bath, King Bladud, were based on truth. He claimed that ancient British stone circles were the remains of once more elaborate buildings designed by Bladud. Detail of a carving on the fallen lintel, stone 156, of the central or great trilithon. 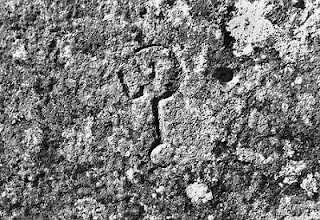 The carving, which is in the form of a question mark with the initial LV within the loop, was according to Atkinson cut by an itinerant workman c.1829. Question mark? Looks more like a crescent and connected circle. 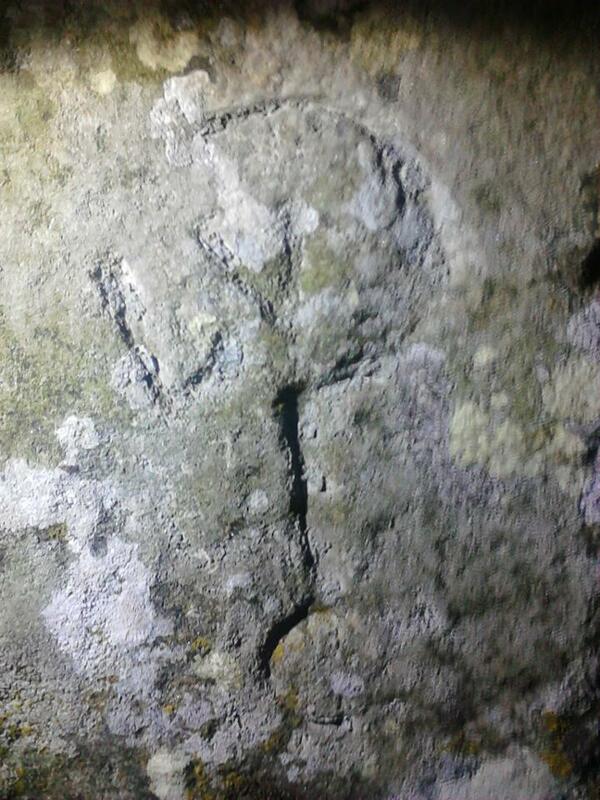 A masonic mark? Connected to Wood? The carving today (ringed) click for much larger. 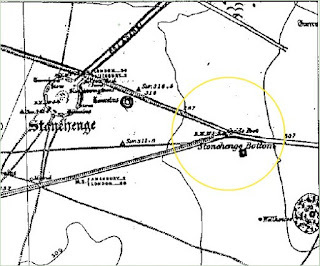 The planning application for detailed work at Stonehenge monument includes details of how the Avenue will be marked with a brass arrow pointing to the midwinter sunset and midsummer sunrise axis - http://southplanning.wiltshire.gov.uk/public-planning-application-documents/00537500/00537003_Plan_Views.pdf - The marked axis is between Stonehole 97 and the Heelstone, not over the top of the Heelstone. 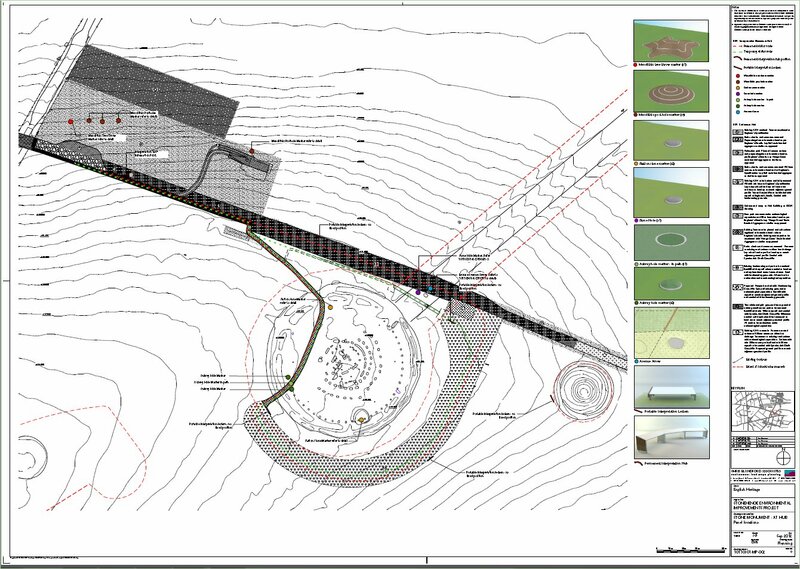 Stonehole 97 will be marked with a "stonehole marker" which will look great. 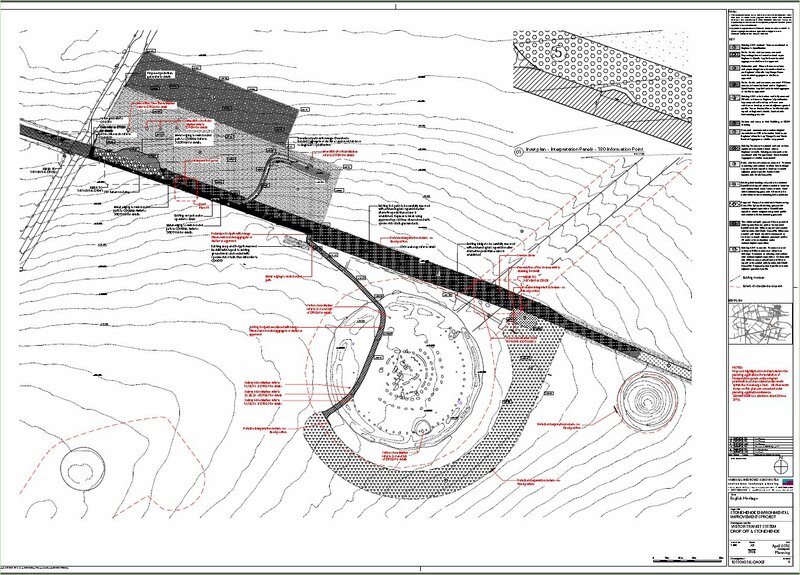 Here is Mike Pitts' plan of Stonehole 97 and other features, which as he discovered the hole probably can be considered reliable. Is it me or has 97 moved in the plans? 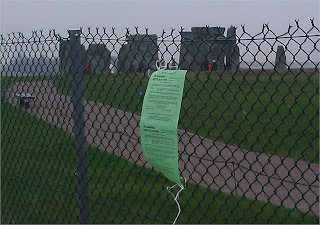 I also note there is no permanent fence around the Heelstone which please a lot of people. Planning notices have gone up at Stonehenge for the erection of some sarsen uprights, replacement lintels and a roof, sorry, for the facilities at the monument with the new visitor centre. The full applications are on line but here are probably the best overview plans. The study also shows that the techniques and amounts of labour used vary from stone to stone. 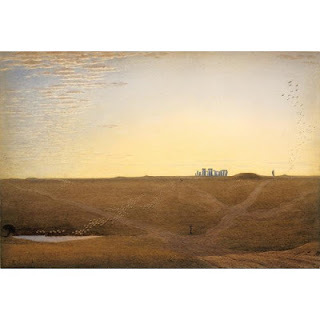 These variations provide almost definitive proof that it was the intent of Stonehenge's builders to align the monument with the two solstices along a north-east/south-west axis. 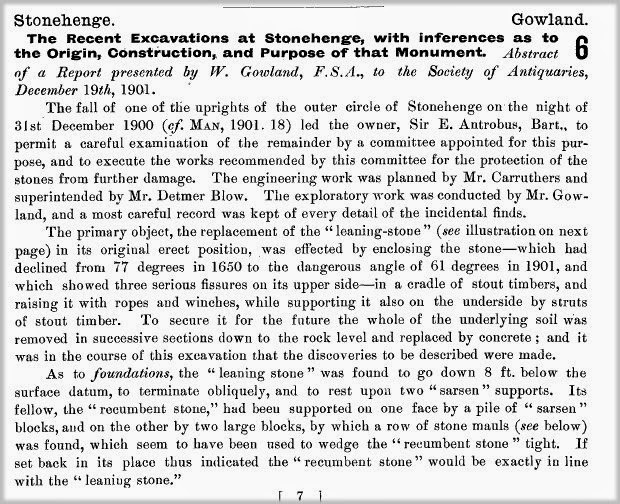 Reading Gowland's report of his 1901 excavation around Stone 56 adds to this story. He says;"The underground face was found to be carefully tooled over its entire surface as shown in fig.28, which represents a large flake that became detached during the operation of raising the stone." "This was particularly well seen on the base of No.56 where it extends below the ground, and had thus been protected from the action of the weather..."
"This tooling was apparently executed with small quartzite hammers. 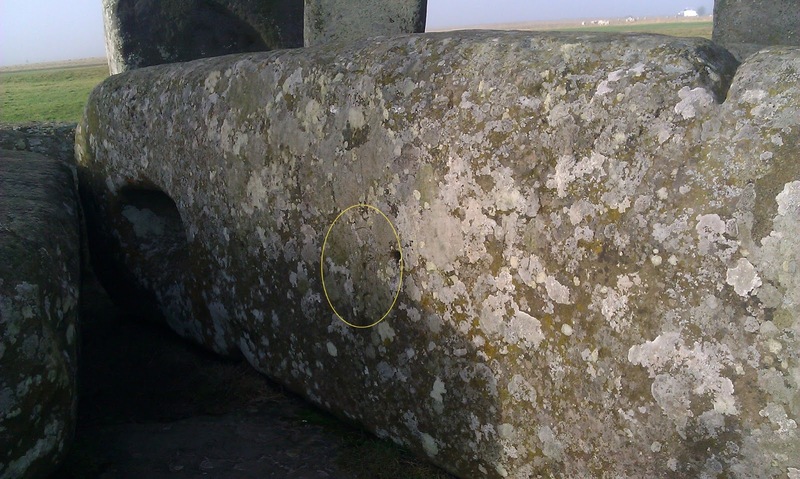 In order to demonstrate that a piece of sarsen was tooled in a similar manner by Mr Stallybrass with a quartzite pebble. 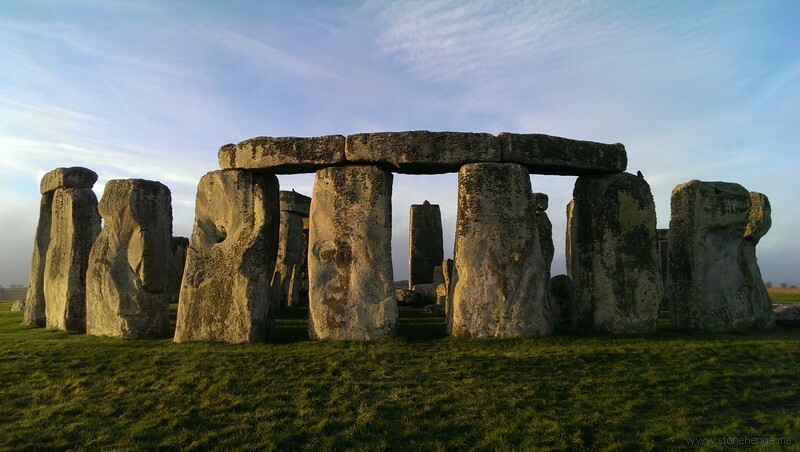 On comparing it with the blocks tooled by the builders of Stonehenge, they were seen to be almost perfectly identical. I may say in this connection that Mr Stallybrass failed to produce anything at all like it with any of his mason's tools." 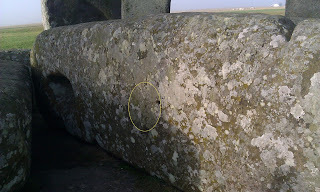 So why did the builders carefully dress the large area of the stone that was going to be buried? 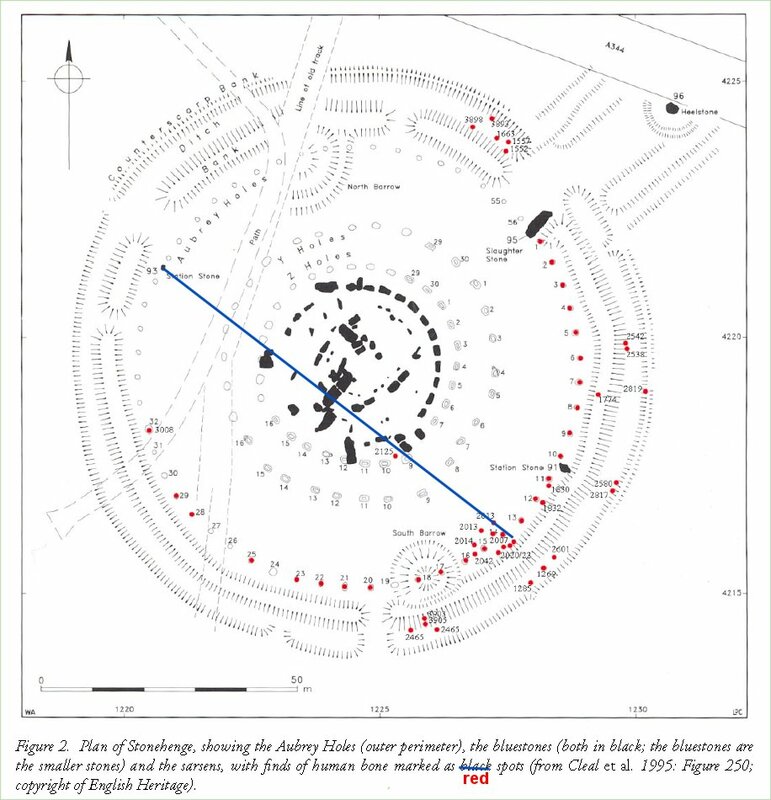 From Parker Pearson, M. and Chamberlain, A. and Jay, M. and Marshall, P. and Pollard, J. and Richards, C. and Thomas, J. and Tilley, C. and Welham, K. (2009) ’Who was buried at Stonehenge ?’, Antiquity., 83 (319). pp.23-39. 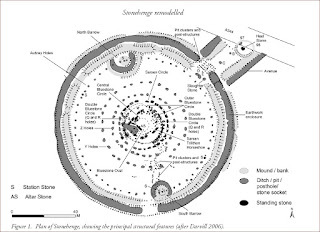 In the last post http://www.sarsen.org/2013/02/all-feature-plan-of-stonehenge.html I featured a plan of Stonehenge which was criticised in the comments for being inaccurate. 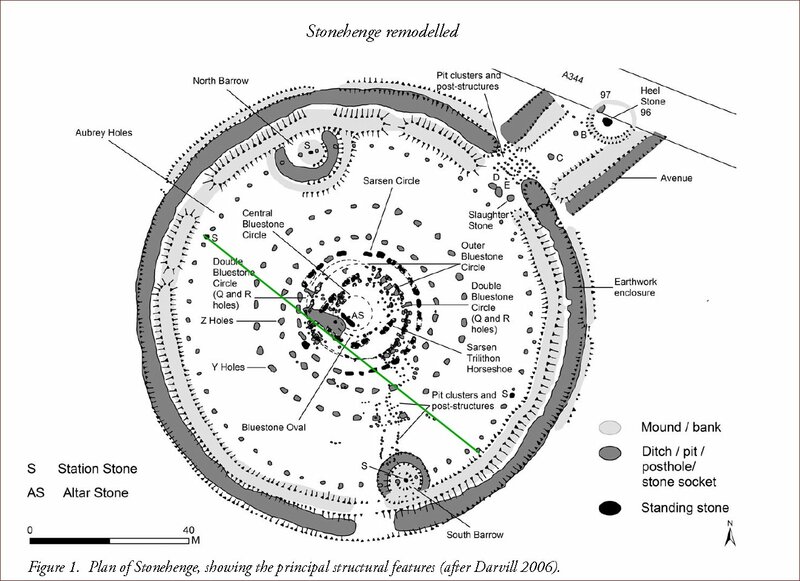 For comparison here is another plan of Stonehenge where the position of the South Barrow and Ditch can be compared. This plan is I believe more accurate. I have used the plan to show how the cremation burials we know about (and there are probably many we don't know about) cluster around the alignment for the mid-winter solstice sunrise. Introductory video of this informal group's meeting. More detail in the links.